I thought it be a good idea to have a thread dedicated to the gold price and general gold trading/investing. Gold spiking like it's nobodies business over the past 30 minutes. Read somewhere that Brits have increased their spent on gold investing and physical buying the past month, just in case Brexit becomes real. 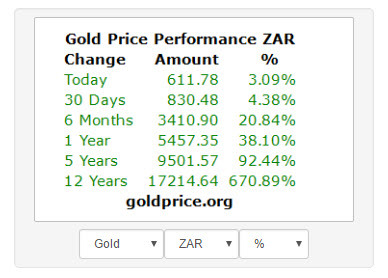 When the JSE is down over 1% I would expect gold to skyrocket. Really stupid question...remember Im a noob! 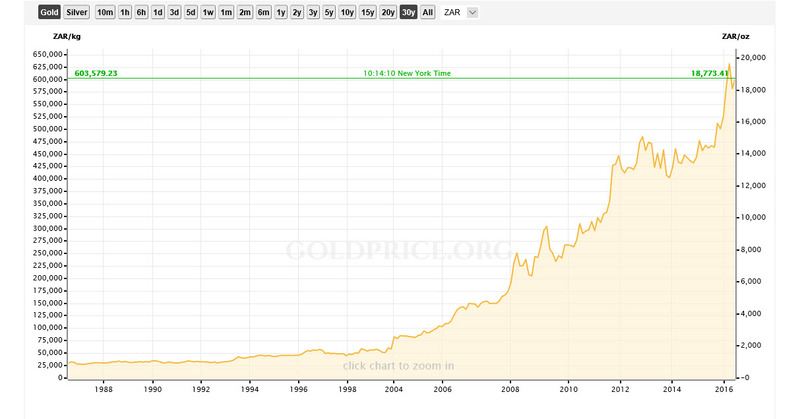 How do you invest in gold... do you have to buy shares in a mining company? Or can you buy 'gold' shares? As a pirate I own some real gold, Keep it ssushhh. Alternatively you can start collecting Krugerrands, which you can purchase through companies like the South Africa Gold Coin Exchange (www.sagoldcoin.com). That same coin was R900 in 2010 when I bought it. What stocks do you guys buy for gold? Mostly used HAR and SGL in the past, but have since moved onto DRD as I feel they have greater potential currently, especially with their March 2016 Q due today. Would it be a bad idea to split a "lump sum" between HAR, SGL and DRD? But then I get the feel with gold business you need to watch stuff so closely and probably don't hold onto it for more than a week? If you prepared to gamble, then yes, buy now and sell when you feel it's time to get out. Some say Wednesday would be a good time to sell as that is when the FED will meet, but I'm leaning more towards perhaps Friday, or even Monday, but that all depends on how the market reacts on the Fed decision and more importantly what that decision is going to be. We all hoping for another hold on rates, otherwise gold will tumble sharply and rapidly. Splitting between them is also fine. Die goudprys in dollar was vanoggend $1 276. Die moontlikheid van 'n terugtrekking in die goudprys tot ongeveer $1 080 wat ons ontledings voorheen getoon het, is moontlik besig om te vervaag. Die goudprys kan dus moontlik oor die volgende paar maande aanhou om te styg tot ongeveer $1 400. Vanoggend was die goudprys in rand R19 260. Indien die rand in die volgende paar weke moontlik tot ongeveer R14 vir een dollar sou versterk, kan die goudprys in rand ietwat daal. Oor die langtermyn kan die goudprys in rand egter heelwat styg. Investors looking to profit from the Brexit referendum – no matter the outcome – should bet on a jump in gold volatility, according to a note from Societe Generale who say the metal will surge in the event of a vote to leave and fall if the result is for the status quo. The precious metal was trading at $1265.71 an ounce at 6:30am ET, down more than $30 in the last three sessions. It is certainly not just gold that will move, as markets in London are bracing for what could be a wild ride in everything from foreign exchange to stocks following the referendum result. So if no Brexit then gold will fall? Good day to be a Pirate! Arrrr. I see gold shares falling today, think I'm going to go harmony when it reaches 47 - 48, might be able to make a few bucks if someone somewhere releases a bad news article about brexit. [...The project will add about 100 000 ounces of gold to Sibanye’s production, or 6.3% of its total forecast for 2016 at a cost of about $476 an ounce, compared with the company’s $908 cost of mining in the first half of this year. Gold currently trades at about $1 316 an ounce.